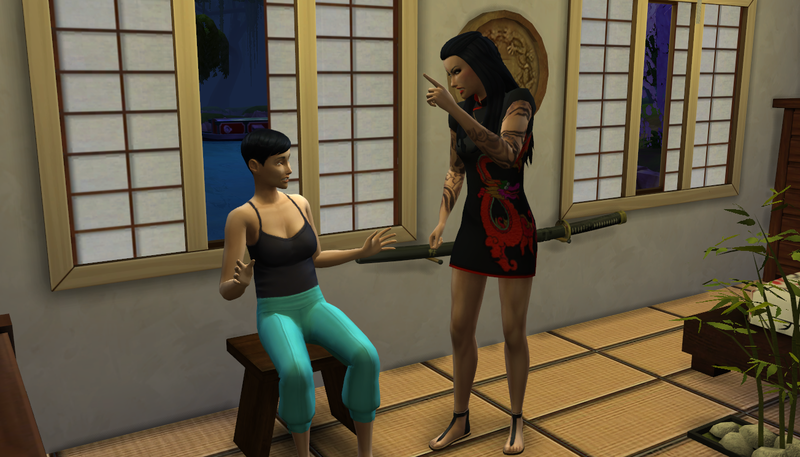 Following Tatiana and Phoenix’s outburst in the garden, the tension between the two of them increased. It spread to Jana, who also had a suspicion that there was something between the pair. One evening, she just about dragged Phoenix up to the women’s quarters and started berating him as quietly as possible. “Have you been seeing Tatiana behind my back? !” She spat. Phoenix recoiled, actually appearing to look hurt. He replied in a sort of whisper, not wanting anyone else to hear. From the sitting room below, Tatiana could hear the faint trace of voices but she’d know Phoenix’s voice anywhere. She hurried up the steps and came between the two, hoping to calm them. “Don’t tell me what to do!” Jana rounded on her, her voice raising slightly. “You are definitely not involved in this argument!” Tatiana narrowed her eyes and seemed to change her resolve. She walked away without a word and headed downstairs, Jana seething at her as she went. Back outside, Atlas worked with Suzu at the punching bag, helping her track her workout. Tatiana came through the gate with a worried look on her face. She approached the two and bowed to Suzu in greeting. Suzu sighed and rolled her eyes, removing her gloves and handing them over to Atlas. “Very well. I will have a talk with them… Thank you for letting me know, Tatiana.” As Suzu walked away, Tatiana smiled at Atlas. Revenge was sweet. Suzu made her way into the women’s chamber and up the steps to the bedroom. The room was dark when she entered and no one was around. She thought next to check the kitchen and headed out onto the deck. When she neared the stairs she heard “curious” noises in the direction of her chambers. She quickened her pace and threw open the doors to her bedroom. Suzu bypassed embarrassment and went straight to furious. “Get out of my bed!” She shouted, throwing up her hands. Jana and Phoenix jolted apart, each saying their own choice swear and collecting themselves. Jana actually looked sheepish as she stood there; Phoenix sat on the edge of the bed, looking at his hands in his lap. Jana moved towards the door and Suzu rounded on her. “Jana! Sit down!” Jana reluctantly sat on the bench near the window and waited for the next round of shouting. Suzu then put her head in her hands, the only sound from the frogs in the pond outside. Lifting her head, she pointed towards the door. “Phoenix, go to your quarters. We will discuss this in the morning…” Phoenix got up and quickly left the room. Suzu then turned to Jana who sat with a worried expression on her face. Busted! And in lady Suzu’s bed no less… The nerve!! !